When you set up an Ad Targeter campaign, consider who will receive the emails and what type of ads will have the most success with those users, and any particular subsets of those users. For example, what do the users have in common? Are they located in an area local to the ad you’re running? Are the users’ interests similar to the product or service in that day’s ad? By taking the metadata you have for your users on any given list(s) and combining it with the data you receive from using Personalization Engine’s behavioral tracking technology, you can make data-based decisions about your targets. These targets will help you match up an Ad Targeter campaign with a relevant group of users. For example, you can target users in Florida with an ad for a restaurant located in Miami. Or include an ad for sports gear for users whose internet activity indicates they have a strong interest in sports. Creating targets involves using Audience Builder to determine what criteria you want to set in place. 1Create an Ad Targeter Plan in My Sailthru. For more information see Create an Ad Targeter Plan. 2In the Ad Targeter side navigation bar, select Targets. 3Click the New Target button. 4This will launch the Target Name dialog box in which you can name your new target. If you’d like to add criteria, click + Add new criteria. Please see the Audience Builder and Audience Builder: Criteria Glossary for the many possibilities for segmenting subscribers. Choose either All or Any from the ‘Match __ of the following’ dropdown. All – selects users that meet all lines of criteria. Any – selects users that match at least one (but not all) of the criteria for your target. 6Click the Estimate Impressions button to check how many of your subscribers would be targeted. 7Click + Add new criteria+again if you want to modify this estimation, otherwise. 8When you have completed adding criteria and estimating impression, click the Save Target button to save your criteria and return to the list of existing targets. If you want to estimate impressions for an existing target, click on the wrench icon next to the Target. 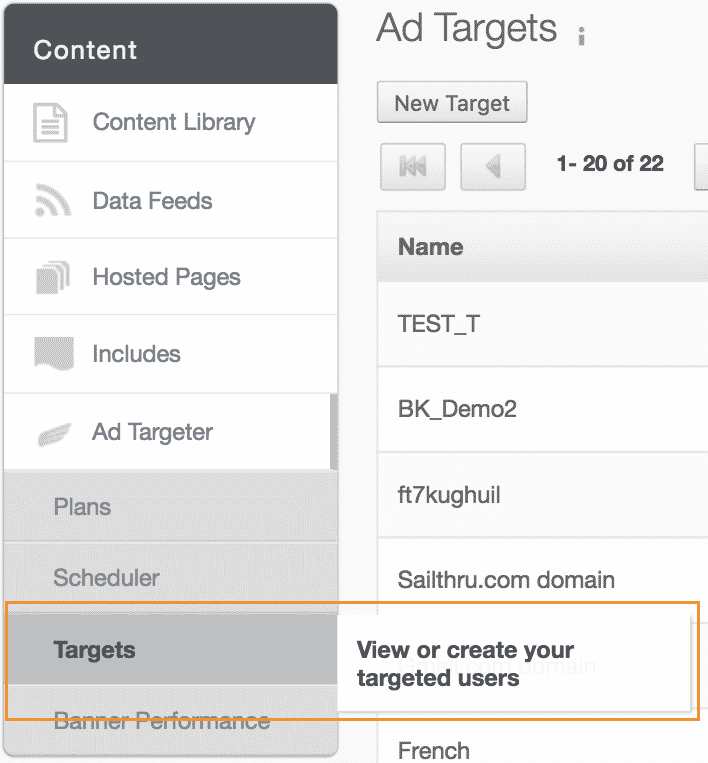 Once you have set up one or more targets, you can specify targets when uploading ads for your Ad Targeter plans’ slots using the Scheduler. The target will determine which subscribers will view the ad you’re uploading. An ad may not render due to technical reasons. For example, on an iPhone, many emails don’t display completely. Instead, you need to click on a link to download the full email. In these cases, an ad doesn’t render because the iPhone doesn’t “fetch” the ad. For this reason, ads displayed near the header of an email tend to show higher impression counts than ads placed in the footer.